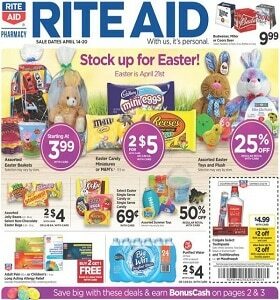 Rite Aid Weekly Ad April 14 - April 20, 2019. Stock Up For Easter! -$7.99 Secret or Gillette Clinical Antiperspirant/Deodorant; buy 1 get 1 50% off Huggies Diapers, Pull-Ups, GoodNites and Wipes. To see the weekly circular for your favorite Rite Aid store, search by ZIP Code or city, state.